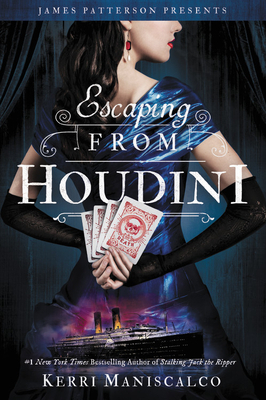 Kerri Maniscalco, "Escaping From Houdini"
The #1 New York Times bestselling series that started with Stalking Jack the Ripper and Hunting Prince Dracula continues in this third bloody installment! A luxurious ocean liner becomes a floating prison of madness and horror when passengers are murdered one by one...with nowhere to run from the killer. Audrey Rose Wadsworth and her partner-in-crime-investigation, Thomas Cresswell, are en route to New York to help solve another blood-soaked mystery. Embarking on a week-long voyage across the Atlantic on the opulent RMS Etruria, they're delighted to discover a traveling troupe of circus performers, fortune tellers, and a certain charismatic young escape artist entertaining the first-class passengers nightly. But then, privileged young women begin to go missing without explanation, and a series of brutal slayings shocks the entire ship. The disturbing influence of the Moonlight Carnival pervades the decks as the murders grow ever more freakish, with nowhere to escape except the unforgiving sea. It's up to Audrey Rose and Thomas to piece together the gruesome investigation as even more passengers die before reaching their destination. But with clues to the next victim pointing to someone she loves, can Audrey Rose unravel the mystery before the killer's horrifying finale? Kerri Maniscalco grew up in a semi-haunted house outside New York City, where her fascination with gothic settings began. In her spare time she reads everything she can get her hands on, cooks all kinds of food with her family and friends, and drinks entirely too much tea while discussing life's finer points with her cats. She is the author of the New York Times bestselling novels Stalking Jack the Ripper and Hunting Prince Dracula. If you're unable to attend the event and would like a signed copy of Escaping from Houdini, please purchase the "Signed" version below.